Apply now for 2019 Crew Leader and Crew Member positions! This summer and fall could change your life! VYCC pays crews of youth (ages 15-18) and young adults (ages 18-26) to work with Crew Leaders, adults over age 20, to help change our world. How? 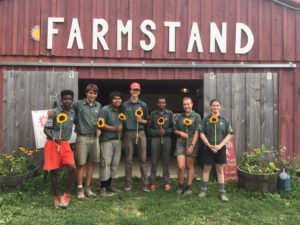 Through outdoor experiences that spark future jobs and learning and help save the planet through fighting climate change with conservation work and feeding Vermonters in need via organic farming. Apply to Lead a Crew by May 1! Apply to be a Crew Member by May 15! Questions? Email our Recuitment Manager, Nora. #OneCorpsAllCorps | Let’s Dig In! Our Corps is made up of Crew Leaders and Crew Members who are supported by a big team of seasonal and full-time staff, along with our many project partners who work directly in the farming and conservation sectors in Vermont. Come change the world with us through farming that feeds Vermonters in need or by protecting our environment and improving outdoor recreation. We pay all our positions (yes, this is a job!) to be outside and be on a crew doing your part. Youth and young adults are our powerhouse Crew Members, led by awesome adults (ages 20 or older) who all team up for 4 or 8 weeks in the summer, for 8 weeks in the fall, or for both the summer and the fall. Your crew will quickly bond as you tackle challenging projects, improve your personal and professional skills, and yes, have fun! Crew Leaders are at least 20 years old, (often in their 20s or 30s) who have some outdoor work and leadership experience, as well as some additional qualifications. Our Crews are lead by pairs of Crew Leaders, teamed up to complement each other in skills, backgrounds, and social identities. Often we hire former Crew Members to step up to be Crew Leaders. Apply by May 1! Check out our full Conservation Crew Leader Position Description and Food and Farm Crew Leader Position Description. Put me in coach! I want to be a Crew Leader! Crew Members are Vermont youth (ages 15-18) or young people from all over (ages 18-26). No experience is needed as you join a crew your same age, led by two older Crew Leaders on conservation projects or on our farm. We strive to hire crews that come from diverse backgrounds and experiences. 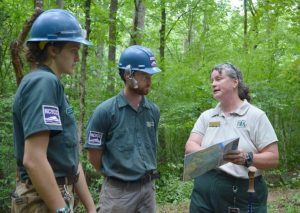 Depending on your crew you may focus on leadership skills development, watershed restoration, trail work, farming, or more hands-on work. Apply by May 15! I want to team up! I want to be a Crew Member! We have a variety of crew experiences that start as early as March/April and go as late as October. We operate in 4-week sessions, with the majority of the season happening from mid-June until mid-August. Conservation Community Crews – Join other Vermont YOUTH for the SUMMER from Burlington, South Burlington, Williston and Woodstock in city parks, natural areas, and at the Marsh-Billings-Rockefeller National Historical Park. Work with us in the day and sleep in your own bed. I want to learn more and check the 2019 crew dates. I am ready to apply to be a Community Crew Member! 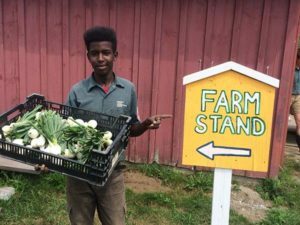 Farm Community Crews – Team up with other Vermont YOUTH our farm in Richmond or in Newport for the SUMMER on the Bluffside farm and help feed Vermonters in need through our award-winning Health Care Share program. Work with us in the day and sleep in your own bed. Learn more and check the 2019 crew dates. I am ready to apply to be a Farm Community Crew Member! Spike (Camping) Crews – Vermont YOUTH and YOUNG ADULTS (from anywhere) dig into projects on the Long Trail, in Vermont state parks, and in the Vermont back country as you live/camp near your work sites. In 2019, we will have SUMMER YOUTH regional Spike YOUTH crews in Dorset, Washington County, Lamoille, and this FALL young adult crews that will be in a variety of places around the state. We offer slightly longer-lasting Spike Crews into the fall and, to help increase diversity and access in the outdoors, award-winning identity-based Spike crews for American Sign Language (ASL) Inclusion and Women of Wilderness (WoW). Learn more and check the 2019 crew dates. NOTE: Our Young Adult summer Spike Crew is now full. I am ready to apply to be a Spike Crew Member! 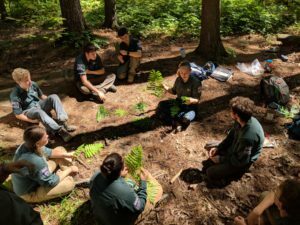 Peer Crews – These are highly skilled crews for Corps Members who team up in the spring or stick around into the fall to do more technical projects, deepening their skills together! These crews are made up of either Conservation Crew Leaders in the Spring or Fall or Food and Farm Young Adult Crew Members who are ready to work together with year-round Farm staff. NOTE: These crews are now full for 2019. Not sure what to apply for? Find your fit! Strong crews are diverse crews. VYCC has a deep commitment to excellence. We believe we are strongest when our team includes members with a broad range of life experiences. We strive to achieve this at all levels of our organization, and actively encourage and recruit, develop, and retain the most talented people from a diverse applicant pool. VYCC is proud to be an equal opportunity employer. Being a VYCC alum is worth it. After your season, you join a growing network of over 7,000 alumni who are now in tons of different job sectors, doing all sorts of cool jobs. Our alums often look to hire recent alums! VYCC is also committed to making sure you get lots of alumni perks including on-going learning opportunities in the trades, future career or college application support, pro-deals and discounts with select local businesses and the opportunity to earn academic or internship credit. Scholarships of $1,000 are available to all VYCC alumni accepted to attend Sterling College. Will we see you at Start Up this June?